The movie opens with a whirling Master Sword and Link's large shield. Together they join near a classic "The Legend of Zelda" title, the same used as last year E3, very much in the Ocarina of Time's style. The whirling sword, the dry sound effects and the next brief scene with Link showing off his swordman's skills from the now familiar screenshot seems to indicate the game emphasizes on the sword fight aspect. Indeed most of the movie is made of fighting scenes. In the next scene however, Link is seen swimming among many little fishes, the motions are pretty realistic, from the arm movement to taking a deep breath, but the most interesting is the fact Link seems to be able to dive, like in Ocarina of Time and unlike The Wind Waker. The water element has nice realistic effects like one expects from a Nintendo game. 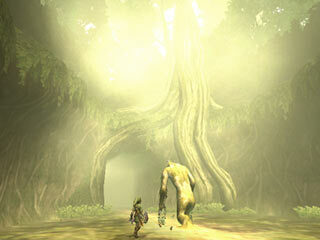 We are then introduced to a new character, in a sun drenched clearing: a long-armed giant with ferns growing on him. The character is actually barely seen (one close-up on his left side, one shot from afar) and his face never shown, would there be some strange secret about him ? IGN first thought was for Sony's Ico, well, we definitely don't have the same references... the first thing I thought of when seeing this pale skin middle-sized giant is of course Doshin, the silhouette is extremely reminding of him. Could it be the answer ? Doshin in Zelda ! Link playing with cats is probably the last thing you'd expect to see in this more mature and gloomy Zelda, and yet, it is what happens next. This also brings immeditately to mind two references: the first one is the dogs we saw in some early screenshots, Link will definitely have to interact with pets and so far, we haven't seen the usual chicken; the second one is Nintendogs on DS, which Nintendo showed off also during Iwata's keynote speech. We have to remember what was recently said, that Nintendogs was first developed for GameCube, maybe there's something of it in here. After all the behaviour of the cats look very realistic and sophisticated, their head follows Link's motions carefully and then run after him tails up while he is carrying one of their comrades. 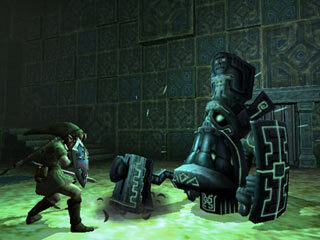 The mechanical statue of the next scene evoques a classical Zelda's enemy, Armos, as seen in the latest Zelda instalment, The Wind Waker. IGN says it's a boss battle, well, that's very unlikely, it looks too small for a boss. It is probably a mini-boss battle, maybe the first official encounter (thus the door closed with bars) with an enemy which will return many times again. This enemy handles a hammer. 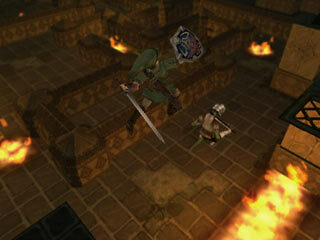 Various Link's attacks are shown in the three next scenes: jump attack against a lizard warrior in an environment very similar to the Temple of Fire as IGN mentioned, shooting arrows against bat-like creatures and horse riding. The similarity with Wind Waker's engine is felt quite well here, like the little pause triggered when dealing a powerful blow to an enemy or the camera panning and the light effects when using the bow. In the riding scene, it is difficult to understand what kind of weapons Link's chasers are using to attack him, sometimes it looks like they are throwing flaming stones with a sling, some other times it looks like they are throwing short spears. Right after that, Link is facing in a dark and gloomy environment skeletons of what definitely looks like the boars we just saw. 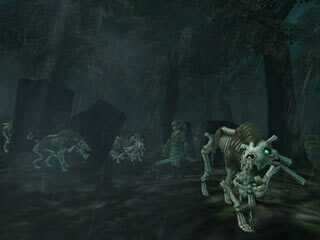 This scene is actually very reminiscent of the creatures coming at night in the Hyrule's plain of Ocarina of Time. And it's precisely a familiar character of the Nintendo 64 title that we see next but in a surprising situation, Link fighting a Goron, the usually friendly and smiling race, that is indeed most unexpected, but this Goron definitely looks different with sharp teeth and an aggressive look. The fight takes place in an environment we had seen months ago, a rocky background bathed in the sunset rays. Stalfos coming back to life was one of the most thrilling sight of The Wind Waker fights. This is happening here as well, with even more details (all the large bones gathering one by one) and in greater number (3 stalfos at a time). 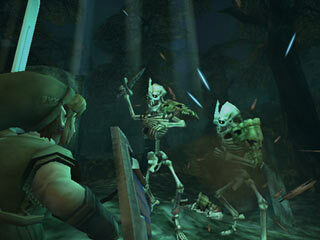 Those Stalfos look huge, twice taller than Link, and fight with short pointy swords. Light effet in the next scene with what a fixed angle camera a la Resident Evil for a fight involving a lizard warrior and what appears to be another lizard warrior wearing a single-horn skeleton mask. 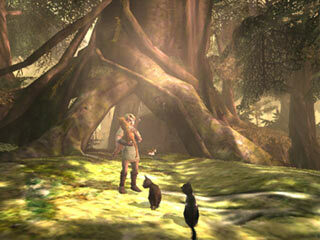 Now we are into the newest scenes of the games with the least elements from past Zelda games. 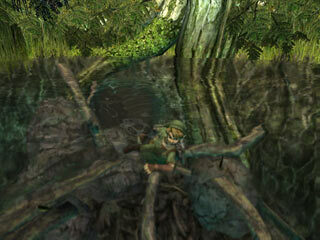 Without Link's presence, it would be nearly impossible to figure out these scenes are from a Zelda game. 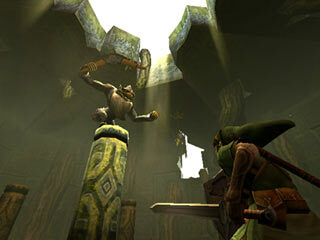 Link is fighting an old bearded baboon (notice the red buttocks) with an evil looking face who attacks him with a boomerang. IGN seems again completely wrong when they suggest he's teaching Link how to use the weapon, it looks more like if Link is trying to fight this unaccessible enemy (he jumps from column to column) to gain the boomerang as a new weapon, and one thing happening is that the weapon accidentally cuts another enemy chasing Link, some rampant carnivore plants. What follows is what you'd expect to see in Eternal Dakrness but not in Zelda, some scary looking ghost soldiers in some sort of underground passage with water, much like a sewer (notice also a yellow kind of vapor). 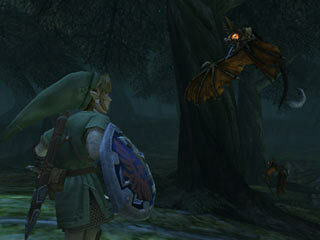 Another curiosity in the next scene shows Link trapped in a cobweb and attacked by a big spider (a living Skulltula ?) before he actually manages to free himself with a powerful sword attack and counter attacks with a deadly stabbing move. Monsters take their revenge next in a chase where Link is oppsed to several flying creatures, four to be exact, who look like the prehistoric Pteranodon. 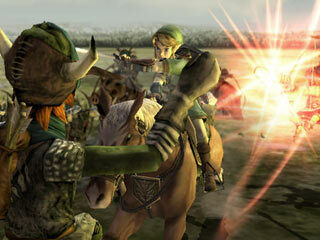 Link fights them with his bow when riding. The environmnt however is maybe what is the most interesting, a bleak foggy landscape with scary-looking leafless trees, much in contrast with what we saw so far. In the distance we can see the gate of a very tall castle, some strange short columns precedes the entrance. Another scene. This time Link is running away from an enormous spider, Gomah in its original NES shape it seems, who also somewhat looks like the final boss of Metroid Prime. The interesting thing to note here is Link's changing expression, mouth wide opened (fear or breathless ?) and its eyes carefully set on its opponent, then back to a normal expression. Again, much the same as in The Wind Waker. Very interesting gameplay elements are unveiled next. More fights with Stalfos follows but one careful eye might see that Link seems to have a new move which allows him to avoid attacks; in this scene, he simple avoids a sword attack by bending a little backward. Stylish. Big surprise next, Link is riding a huge boar, much like the ones seen in Princess Mononoke, and charging into groups of enemies. 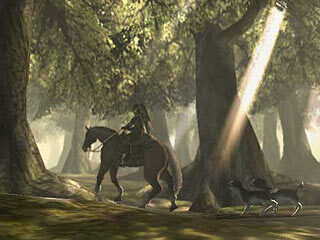 Link will be able to ride other creatures than horse, that could open the door to lots of interesting ideas... The next enemy Link is fighting is some creature with sharp teeth and entirely covered with some strange moving patterns, maybe with a liquid-feel. It vanishes with rays of purple lights, not so much in The Wind Waker style as one could expect. The final scene sums up quite well the atmosphere of the whole movie: the background is a huge yellow moon, before it the silhouette of a wolf standing on a cliff is howling. Not your typical Zelda for sure. And that's maybe what stands out the most of this trailer. No matter what some people say, this Zelda doesn't look so much like a Zelda. First, it's much gloomier than usual ("it looks gloomy" is the first words someone I was watching the video with said) and despite some familiar enemies, the connection with past Zelda games seem much weaker than before. It wouldn't be a problem if we recognized the touch of the Zelda's universe, but it's rather difficult in scenes such as the monkey-troll fight or even the "cats nursery". 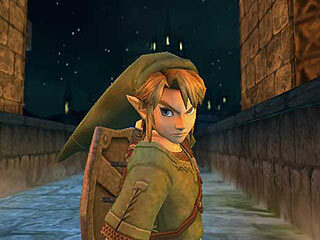 The new Zelda looks like a very good-looking and exciting game, but isn't it going too far from its original roots ? Isn't it becoming something else than the Zelda we love, which, despite all complaints, The Wind Waker stayed very true to ? Time will tell, in the meanwhile though there are probably more reasons to be excited than to be fearful.